So What If It's Ugly? It Just Keeps On Going ... : Krulwich Wonders... Thank heavens it's not pretty, not thirsty, not useful, not a bother, not nearby. It looks like a mess of rope. But, oh my, is this plant old. Really, really old. Far, far, far away is a great place to be — if you want to stay marvelous. 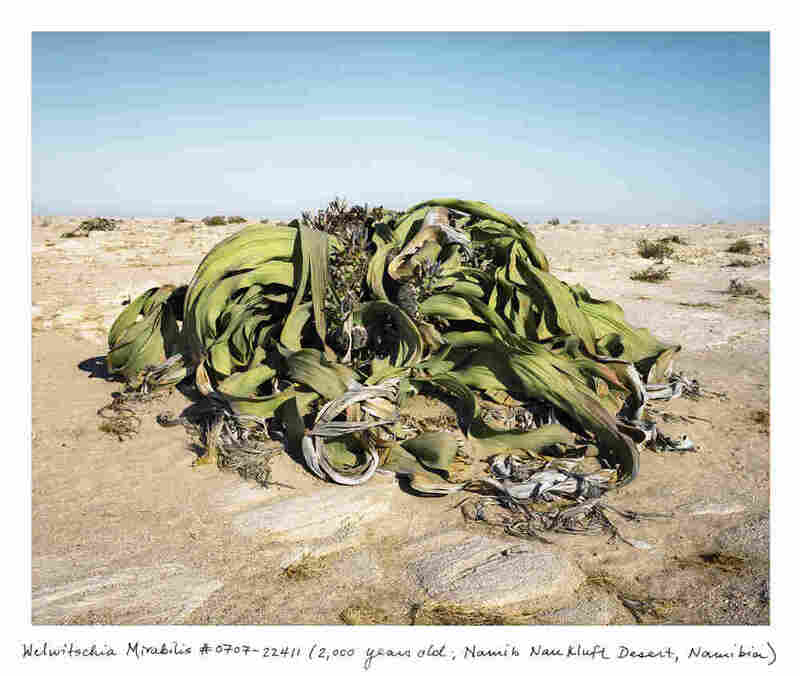 There is a plant, called Welwitschia mirabilis (mirabilis being Latin for marvelous), found only one place on Earth. 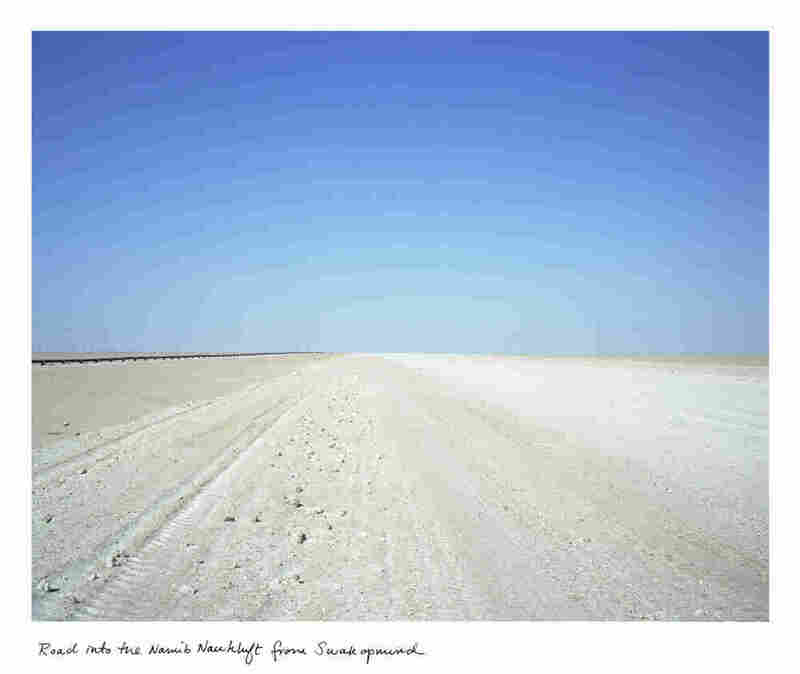 You can get there, as artist/photographer Rachel Sussman did, by driving through the vast emptiness of the Namibian desert, the Namib Naukluft, in Africa. 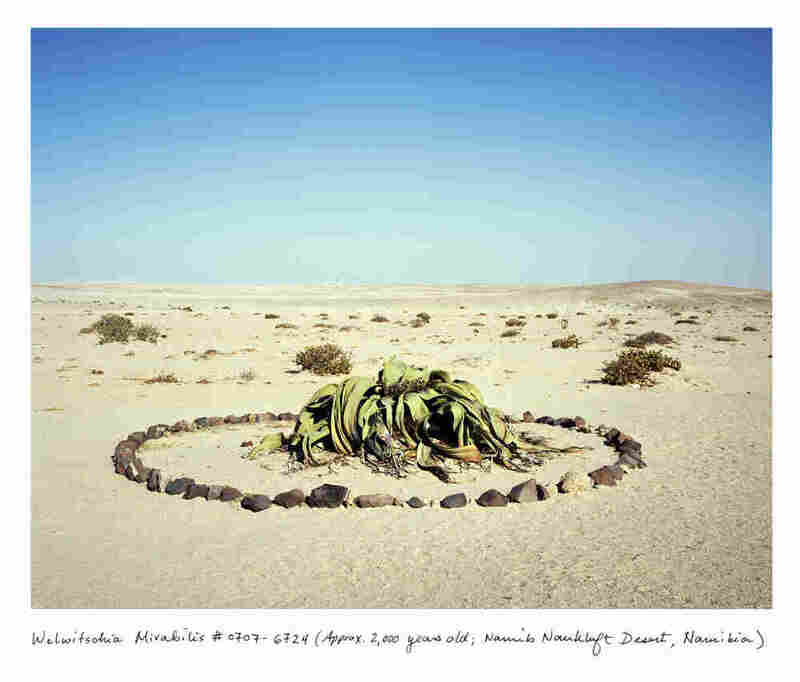 Welwitschia, when you finally get to see one, sits apart. It's very alone. All its relatives, its cousins, nieces, nephews have died away. It is the last remaining plant in its genus, the last in its family, the last in its order. "No other organism on earth can lay such a claim to being 'one of its kind,' " writes biologist Richard Fortey. 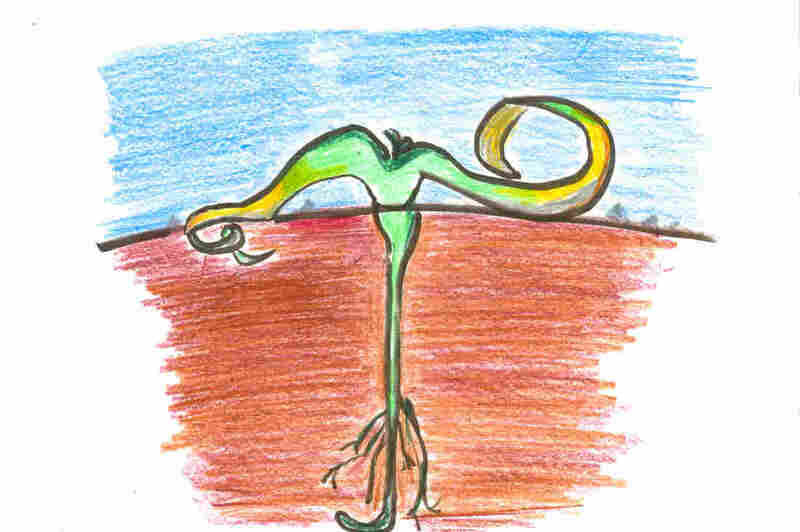 It comes from a community of plants that thrived more than 200 million years ago. All of them slowly vanished, except for Welwitschia. It has survived by doing very little, very, very slowly — sipping little wafts of dew in the early mornings, otherwise minding its own business, as the big, busy world goes by. Here's one. It looks like something that blew off the back of a truck, a tangled heap. Looking the way it does (ugly), it's not a coveted plant. Which is a good thing. "Though you might not guess it," Rachel Sussman writes in her new book, "Welwitschia is a tree." It has a trunk — a very short one — and it grows extremely slowly, with both leaves splaying or pushing out, "like dark green never-ending conveyor belts," writes Fortey. "They often split into several lobes, so old plants look like a weird species of giant starfish stranded on the sands." This one, Sussman guesses, is around 2,000 years old. "When they get to a couple of meters long, the ends of the leaves simply wear out and curl up and fray into gray, whiskery threads, so it is only their continual renewal from the center that allows the plant to carry on growing and photosynthesizing," says Fortey. 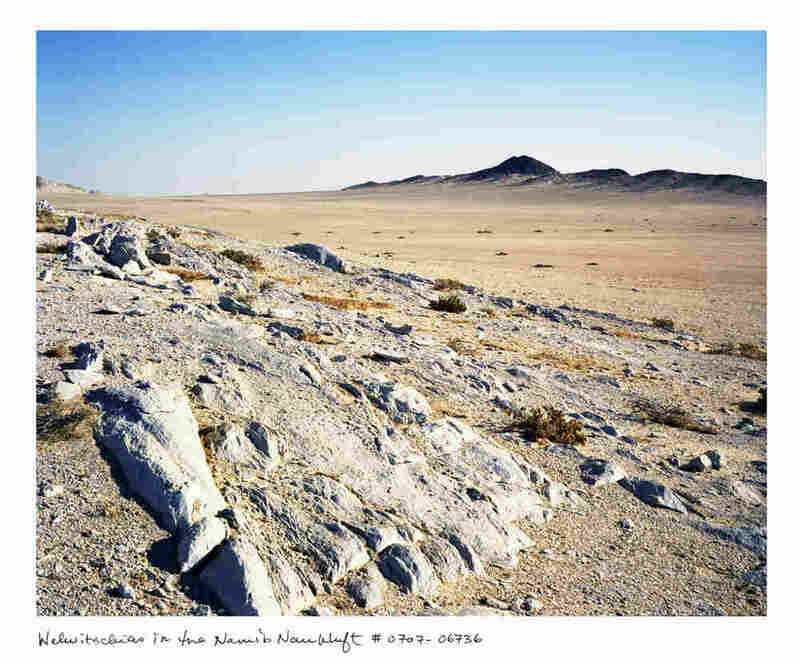 Welwitschia was "discovered" in 1859 by an Austrian explorer and botanist -- Friedrich Martin Josef Welwitsch — but dinosaurs "discovered" them, too. Welwitschia plants were around when the killer asteroid hit our planet 65 million years ago. They stayed when the ice came. They stayed when the ice went. They have survived fires, pests, seen an endless parade of new insects, viruses, parasites, people, roads, local wars — and somehow, even today, there are thousands of them in the Namibian desert. How they've survived, I don't know. Why they've survived, I don't know. That they've survived, being so slow, so un-needy, so ignorable, so modest, so quiet seems — what's the word I'm looking for? Rachel Sussman decided one day to track down the oldest among us, the most ancient gnarly trees, impossibly old bushes, grasses, mounds of bacteria. If they're still ticking, she finds them, then takes their pictures. 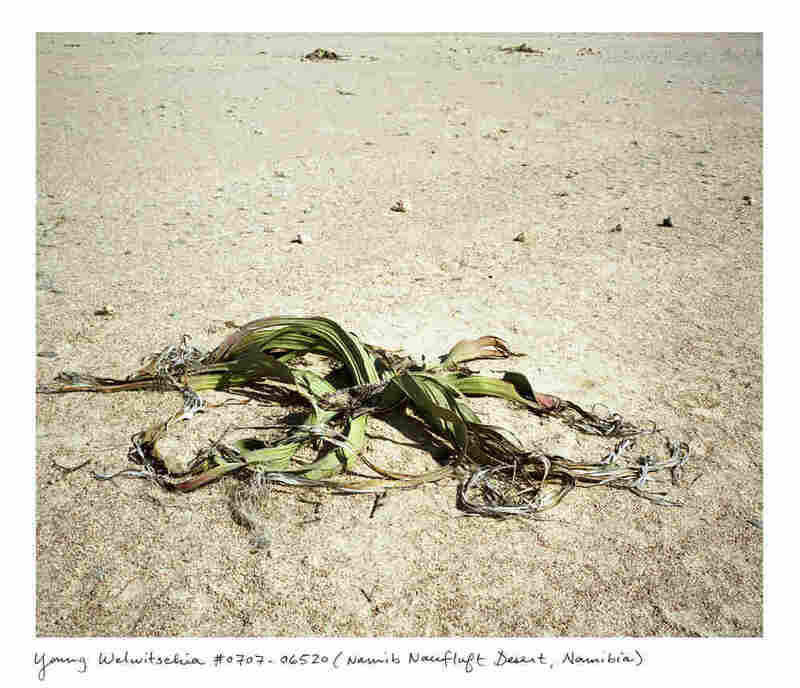 All our Welwitschia photos come from her book The Oldest Living Things in the World. Richard Fortey, who has written about trilobites and all manner of fossilized life, wrote about Welwitschia in his book Horseshoe Crabs and Velvet Worms: The Story of the Animals and Plants that Time Has Left Behind.